The Future is Hand Made. 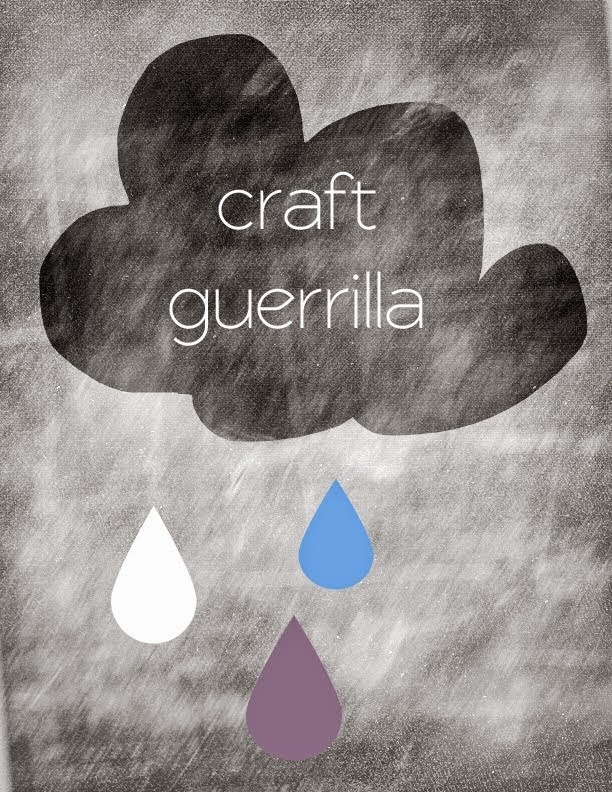 The Craft Guerrilla Residency starts this Thursday! This Thursday the 22nd of November we begin our residency in Finamore, Walthamstow Village London. We'll be there until Xmas eve so plenty of time to get some shopping done! 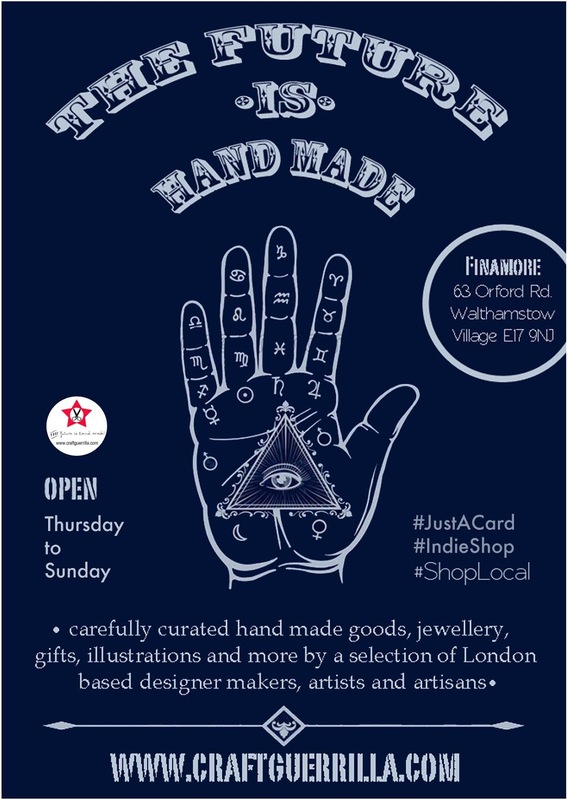 Finamore is a cute little shop which sells vintage, antiques and collectibles and we thought it would make a fantastic backdrop to sell beautiful hand made goods by some awesome London based designers and artisans. Again! 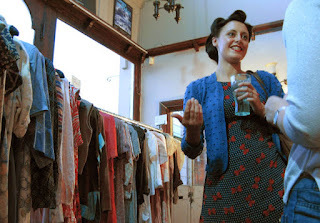 We had a pop up there 7 years ago and it was fab so although we think the way is forward somethings are worth revisiting! 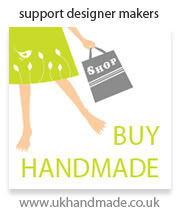 Each item has been hand selected to offer discerning shoppers the best in designer maker talent! 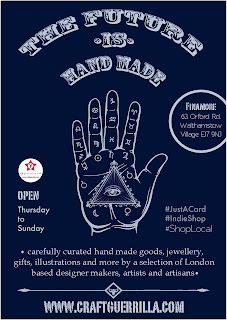 We have tons of beautiful hand made goods, from jewellery, millinery, illustrations, cards, T-shirts to even designer accessories for dogs... Come down and see for yourself! "A celebration of the artist, fashion lover and political activist Frida Kahlo"
These 2 hour bite size sessions are perfect to disengage your mind from work related "stuff" and help you connect with your heart and hands. Crafting has been proven to help calm anxiety and help people deal with stress, did you know that crafting produces a similar state to meditation? Yes it's called flow and we'll help you find yours so you can unwind and relax while having lots of creative fun in the process! "¡Viva Frida!" 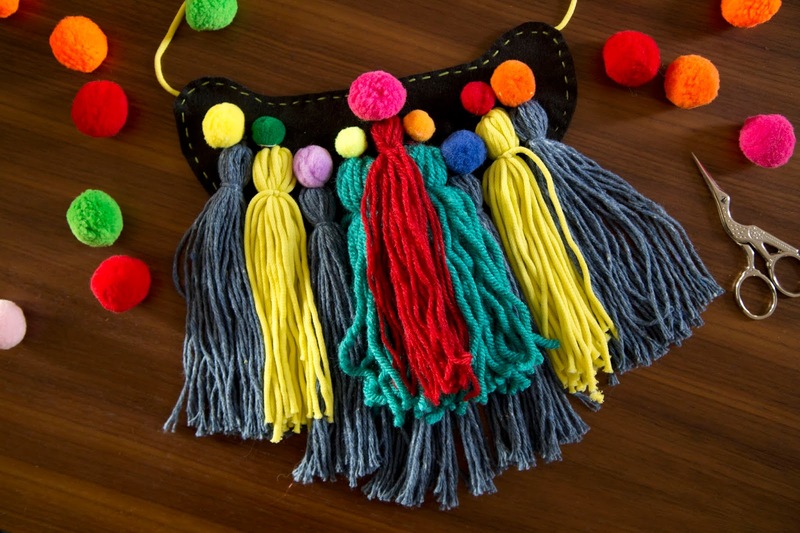 is a pom-tastic workshop where we'll show you how to make a statement necklace using wool, felt and all the colours of the rainbow! Craft Guerrilla will guide you through the basics so you can add a bit of colour to your life by creating pom poms, tassels plus learning to embelish your piece with embroidery and fabric decoupage so you can be more Frida! 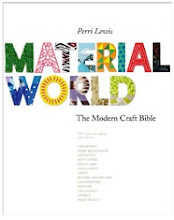 Suitable for all crafting abilities. Please note that the image of the necklace in the photo provided is only to illustrate what you can make. All materials included but we encourage participants to bring any materials they find hold a special meaning like amulets, fabrics, found objects and so on...anything which holds a special meaning to you the wearer and maker! Terms & conditions for Viva Frida! Please note that this is an over 18's only event. In the eventuality that the workshop doesn't fulfill the minimum participant number requirements that it may be cancelled however if this is the case we will refund your ticket and it will be done with at least 24 hours in advance. 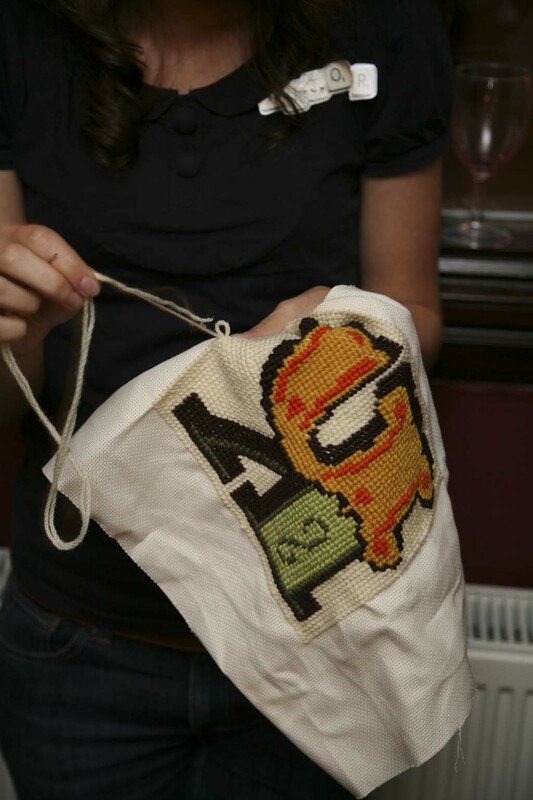 Don't get cross, cross stitch! 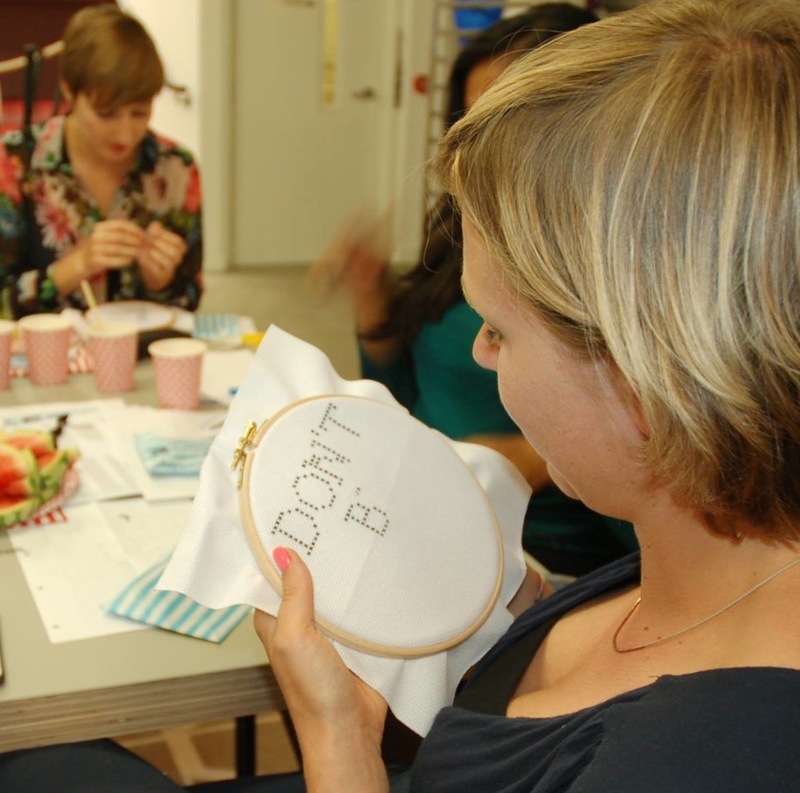 Learn the art of subversive cross stitch with Craft Guerrilla by getting crafty and slightly sweary at this friendly workshop, where you'll learn to create your very own expressive cross stitched hoop. Channel your inner tensions into decorative textiles. 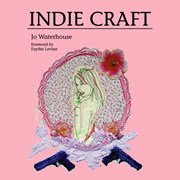 Rude, lewd, crude or just plain honest - this workshop is a playful take on the traditional 'home sweet home' sampler. Instead we celebrate chaos, discord and everyday stresses by keeping our hands busy and making peace with life's many micro-aggressions! The class is all in good humour and during the 3 hour workshop, participants will be guided through the basics of cross stitching as well as a simple lesson in layout, so you can transfer your design from paper onto fabric. This "Flow" inducing workshop promises to be a lot of fun and will also encourage thoughtful and reflective action through creative craft therapy. *Please note that the ticket price includes a drink on arrival. There is also a fully functioning bar/cafe on site. Terms & conditions for "Don't Get Cross, Cross Stitch!" Due to the nature of this workshop this is a class for adults only.Please note that in the eventuality that there is less than the minimum required number of participants that we will cancel the event though we will contact you prior to the workshop (at least 24 hours before the actual event). In the event of a cancellation by the venue or workshop provider that Craft Guerrilla will refund the ticket price and booking fee. Failure to show up to the workshop after ticket purchase on the date does not entitle the ticket holder to a refund. Join us for a Super Duper Charity event! 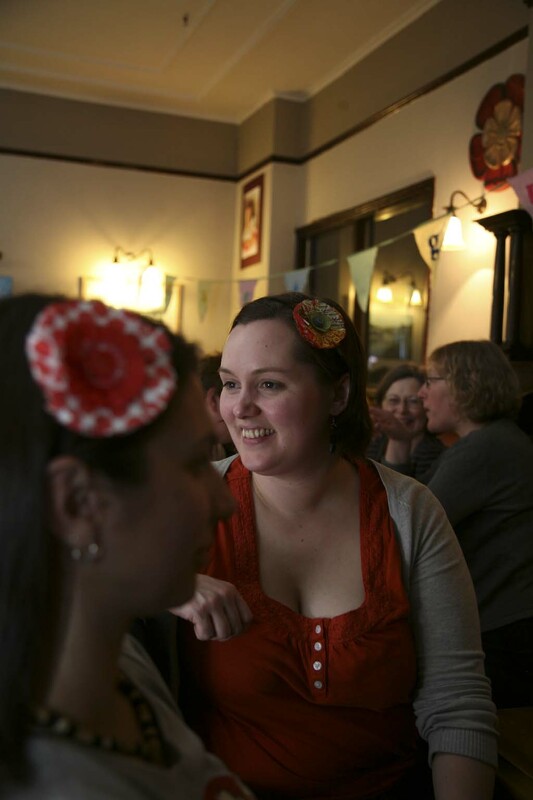 We're so proud to be hosting a swish for our lovely friend Claire at her awesome event! 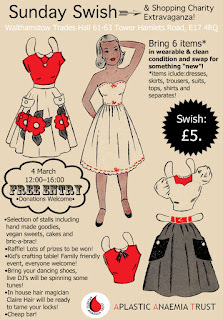 Join us on Sunday the 4th of March from 12pm to 4pm at The Trades Hall in Walthamstow. Claire is organising a charity event in aid of the Apalstic Anaemia Trust and we're so happy to be able to give her a hand! There will also be loads more happening like stalls selling hand made goods, second hand items, vegan food -including chocolates!- a kids craft table, a pop up hair salon run by Claire Hair (no need to book), DJ's spinning tunes (yes we expect some dancing! ), a raffle, and lots more including a cheap bar!!! So mark it in your diary and come along to help us raise lots of cashola for this amazing charity and help us raise a glass as well to all the wonderful people & their families who's lives have been affected by aplastic anaemia. Entry is free to this family friendly event, all welcome! This swish will run from 12pm to 3pm. We'll be taking clothing and apparel between 12pm and 2pm. It costs £5 to participate. Though there is no minimum amount of items there is a maximum of 6 items allowed per swish entry. You will be given a ticket which corresponds to the type of item you have brought in to swap (ie shoes, high st clothing, vintage etc.) Please keep this ticket as you will need to show it at the end of the swish. Just make your way to the Swish area and hand in your items to the Swish Mistress. You'll then receive a swish card with your tickets. We'll be accepting items between 12 and 2 pm. At 2 pm we'll open the newly filled "wardrobe" area. You'll then have an hour to browse and try anything that catches your eye! And finally at 3 pm you will be able to swap your ticket for a similar type item when the swish begins! *Please note that all items must be in a clean and wearable condition. Please wash, mend and press anything before bringing it along. We will not accept certain items: No fur or pelt! At the end of the swish we ask that participants help us by taking back any of their items that weren't swapped. Fashion, fund raising and recycling …we LOVE it! Phew, finally all the Christmas and New Year's Eve shenanigans are over and done with so it's time we get our stuff together and re-focus on our craft work! It's also come to our attention that this January is our 10th anniversary! Yes can you believe it that Craft Guerrilla has officially been going since 2008?! In fairness a lot of time has been taken off recently due to personal reasons -mainly health and family!- so it has been a bit of a long exhausting road with many bumps and hoops which have been suitably jumped through but it's also been one where many new friendships and new partnerships have been forged plus we've been part of lots of amazing projects too! 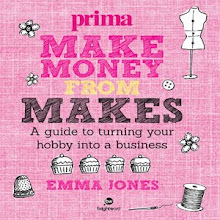 By focusing again on the initial manifesto it's taken me back to the "workshops for the masses" idea and to the belief that craft is something powerful and should be available to all. Plus exploring craft as therapy was something I'd still like to work on. You've probably heard the expression "Flow" and that's how we wanna roll! It's a state similar to meditation which can usually be experienced when performing a repetitive action, like in knitting, crochet and embroidery for example and that promotes mindful reflection. And also because we are a bit of a raucous bunch we wanted to sink our teeth back into subversive crafting and getting involved with a few more guerrilla style activities. 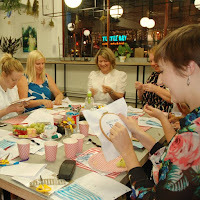 Although we're currently focused on craft therapy through the creation of flow workshops to promote wellbeing we know that craft workshops are also a great way to start your very own making adventure by learning new skills so it's open to anyone and everyone not just to those who are looking for a wellness fix! More and more I see how important the role of making has become, how it connects us to others and to our environment so yes... 2018 is going to be chockablock full of creativity and awesomeness! So in brief 2018 sees Craft Guerrilla teaming up with an exciting new venture so keep those peepers peeled as we'll be announcing our workshop diary and more very soon! 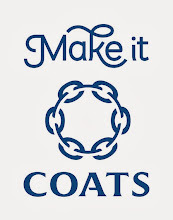 If you wish to be kept in the loop sign up to our mailing list via our website. Oh yes and before I forget Happy New Year!! !